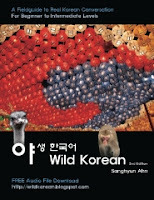 There's a lot of strange foods in Korea that many foreigners are a little scared to try; strange animal parts probably being high on that list. There probably isn't anything wrong with eating those things, it's just that in our culture we think they're strange, so we're afraid to try. Last week I was invited to try some 'strange' meat in a popular chain restaurant called 연타발 (YeonTaBal). 연타발 which specializes in beef, particularly cow stomach and large intestines. Usually when I imagine restaurants that serve these things I imagine a hole in the wall (which I mean in the loving sense) restaurant, perhaps with questionable sanitary conditions (for those who worry about such things), however I was quite shocked to find that 연타발 is nothing like that. It's a high class establishment with the best quality meat and waiters and waitresses that do all the cooking for you as your food is grilled in front of you on your table. Our meal started off with 연타발's two specialties: daechang (large intestines) and yang (stomach). Since 연타발 only serves beef, these were of course cow intestines and cow stomach. They were marinated in a really delicious sauce which looks spicy in the photo, but wasn't really at all. Grilling food on the table is nothing special in Korea, but 연타발 uses a kind of charcoal which burns more evenly, preventing the food from burning badly like sometimes happens at barbeque restaurants. And, on top of that, the waitress does all the grilling for you so you'll never have to lift a finger. The personal attention at this restaurant is really great. I've had gopchang before, and while it's a little chewy, I decided it wasn't too bad. Of course, that was at a little hole in the wall restaurant near my old home in Hwanghak-dong. It's hard to compare that with what I had at YeonTaBal because it would be something akin to comparing street food to a gourmet restaurant... actually, I take that back... it IS comparing street food to a gourmet restaurant. If the gopchang I had in Hwanghak-dong wasn't too bad, this daechang and yang were downright amazing. Hardly chewy at all and quite nice and well marinated. Besides the scary name of "intestines" and "stomach" there wasn't anything too intimidating about them at all. Next, they brought over something that looked a little more familiar, some well marbled thinly sliced Korean beef called 살치살, I guess this would be considered loin meat. This was best after just a quick grill, while all the juices and fat still remained. Dipped in a little salt and pepper, it was fantastic. Actually one of my favorite dishes (if you can really choose a favorite, because everything was so good) was something that wasn't even on the menu, but came as 'service' for our table. I didn't get a photo of it because it was put on the grill immediately, but it was 염통, cow heart. I've had chicken heart before at a Chinese restaurant and thought it was a little tough, but decent, but probably because a cow is probably 20 times the size of a chicken, the cow heart was (huge and) tender. That was the biggest surprise of the evening. Even though I was totally full, my hosts insisted that I try some 양밥 yangbap, or cow stomach fried rice. And, of course, because I'm a cheese loving American, they threw some cheese on top as well. This to me tasted like any typical bokkumbap, I didn't think the cow stomach changed the flavor much at all. Because of location of this branch right in the heart of Jongno, just along the Cheonggyechon, it attracts a wide variety of customers, ranging from loads of tourists on tour groups, to businessmen from nearby offices, to families with children. The prices here make it a place that most English teachers here wouldn't frequent on a regular basis, but for those who are wanting to try some of Korea's 'stranger' foods in a comfortable, clean environment, then this would be the place to come. Even for those who are too scared to try their two specialties of daechang and yang, there are plenty of other high quality cuts of beef on the menu that will surely satisfy you. This restaurant would be the perfect location to celebrate a special event or to bring parents to when they come to town and want to try some interesting Korean food. I visited the Jongno branch (see map below and address below), but as this is a chain, there are locations throughout the country, and there may be one near you! See their website to get a list of their locations. 1st Prize: One person will be drawn to win a round trip ticket to Santorini, Greece for two! 2nd Prize: 30 People will be drawn to win a 100,000 won gift certificate to Blue Fish restaurant. 3rd Prize: 50 People will be drawn to win a 50,000 won gift certificate to Yeontabal restaurant. Tourism in North Korea, a Russian documentary film - Tourism in North Korea, a Russian documentary film A movie by Irina Sosnovaya. Fat or Fit? What's it Gonna Be?